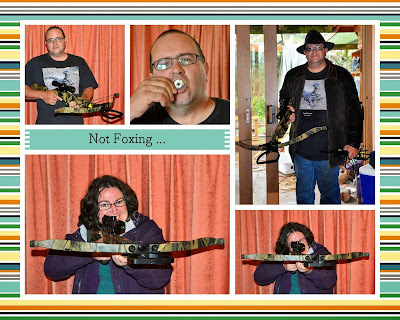 Hamby Home(in)stead ...: The Fox-war! After some discussion, Nick and I bought a cross-bow last Tuesday. (We actually set out to buy to make our purchase on Monday but the shop was closed)! Although we felt rather naughty when buying our prohibited weapon, everything is completely above board. As members of the Australian Bowhunters Association, we were exempt from holding a permit for the purchase. (Nick, Vaughan and I become involved in field archery last year and shoot at a local club regularly). Obviously, proof of membership and photo ID were required - and those details are recorded in a register of sales. When Nick suggested using a cross-bow rather than a rifle for our fox problem, I envisaged something far more medieval in appearance. The reality is vastly different. Ours was at the low end of the range and was fairly basic in comparison with some other varieties. We explained what we wanted to do though, and what we now own is perfectly suitable. Once home again, we showed Erin our purchase and muttered about the fox's days being numbered - just as he sauntered past the window! At this stage the fox is still at large but we know where he lives and have been keeping tabs on his whereabouts. Vaughan has been blowing the fox whistle so often and loud that the poor fox probably has a head-ache (and he/she isn't the only one sick of the whistle)! No more milk for Tea!